Internal audit performs this risk assessment to identify and prioritize key risks to best allocate the internal audit resources for the next year. 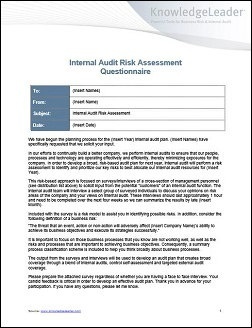 This risk-based approach is focused on surveys/interviews of a cross-section of management personnel to solicit input from the potential customers of an internal audit function. The output from the surveys and interviews can be used to develop an audit plan that creates broad coverage through a blend of internal audits, control self-assessment and targeted external audit coverage. This report presents the results of the vulnerability assessments and penetration testing that security specialists performed on a company’s external and internal facing environment. The intent of the project was to review the security posture of the company’s network, devices, and applications accessible from the Internet. The scope of the review was limited to specific target dates and agreed upon target systems. This sample summary report is designed to deepen understanding of the level of security, to identify security deficiencies and areas of strengths and weaknesses, and to help develop an action-plan to correct vulnerabilities and mitigate the associated risks. The report also documents known vulnerabilities that were detected during the penetration test period; new devices, configuration changes and new/future vulnerabilities were not tested. 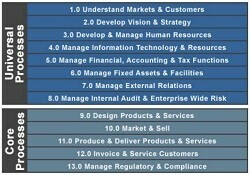 The Protiviti Risk Model is a comprehensive organizing framework for defining and understanding potential business risks and creating and managing the organization’s dynamic risk universe. Boards of directors and management can use this tool to assess and monitor strategic risks impacting the organization. The model focuses on three different types of risks: environment risk, process risk and information for decision-making risk.